Life Outside the Shell: The shocking results of my 24 hour iphone activity log! The shocking results of my 24 hour iphone activity log! One of my favorite things to do when I write is to be real. I had a "step all over your toes" moment with God yesterday that I am so excited to share. Let me start by backing up to how it all got started. Yesterday morning I was pouring out my heart to God. Telling him all the reasons I didn't have enough time to do certain things in my life. Some things I was sharing with him included "Lord, what was I thinking leading a family life group? I don't have time for this! God how will I ever find the time to teach these group fitness classes? I just need to quit. I can't juggle being a mom, business owner, church leader, blogger...oh that blog! I haven't written in two weeks what was I thinking starting a blog?! No one is reading it anyway, I should just quit." You get the picture of my rant...God was so sweet to allow me to go through my dirty laundry with him before he began to gently speak to me. After I was done and got quiet to listen to him, He began to show me some errors in my perspective. He showed me that all the things I was saying I didn't have time for and that I just needed to quit doing were all the things HE called me to do. I didn't once mention something crazy....like quit spending so much time on the computer or my phone. "Oh no God, please don't bring up the issue of my phone. Anything but my phone! I will fast, give up sugar, you name it...just not the phone!" So, being the loving Father that He is, He asked me to keep a log for 24 hours of my iphone usage. From 3pm on Monday to 3pm on Tuesday I kept a tally page for every time I got on my phone or was about to get on my phone. I was shocked that within the first hour I had grabbed for my phone almost 10 times!! My total number turned out to be 32 interactions my phone in 24 hours(and I was asleep and at work for part of that!)...WOW. If you do the math and assume a minimum number of minutes on the phone each time was 2 minutes, I was on the phone texting, emailing, Facebooking, etc for over an hour in 24 hours. That doesn't include other time I spent on the computer(I tracked that and it was a separate 1.5 hours on top of the other hour). Truth be told, my numbers are a little lower than normal because every time I had to make a tally for grabbing my phone it made me stop and realize how ridiculous it was that I was on it again! So why am I sharing this with you? 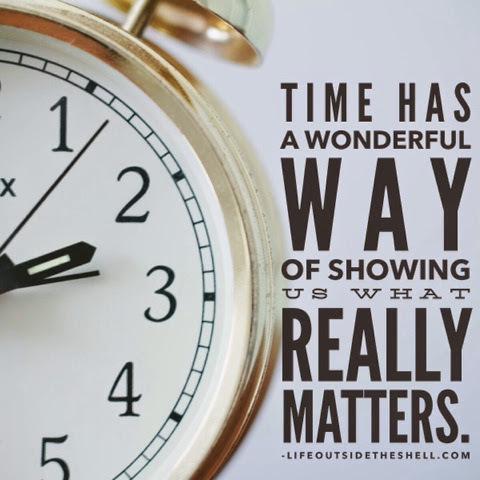 To challenge you to evaluate how you spend your time each day. You may not be an iphone addict, like me, but maybe there is something that is eating away at your time everyday without you realizing it. I love this quote because it gets to the heart of the matter on how we spend our time. We spend it on things that really matter to us. What matters to you? I know I am very convicted to take a closer look at my life and the things I am spending my time on. You can make more money but you can't make more time. Ask God to show you today any areas that are robbing your time. I pray He gives you a fresh perspective on how HE wants you to spend your valuable time! As for me, I will now be setting scheduled time to do computer work and leaving my phone in the other room as much as possible. I am going to intentionally unplug so that I can focus on the things God has called me to. Love this Rachael! Such a great reminder of where I spend my time! Definitely going to check myself tomorrow!